Back in 2014, Assassin’s Creed Unity disappointed quite a few video game fans due to the glitchy state the game shipped in. This was a pity taking into account that Unity was a pretty good game with the best Assassin’s Creed story since Assassin’s Creed II, while the game also boasted incredible graphics and a stunning recreation of 18th century Revolutionary Paris. It was hard to forgive the game’s litany of bugs, though, some of which were quite funny and included disappearing faces, characters falling through the ground and other graphical glitches. Thankfully Ubisoft patched most of these glitches out of existence and Unity is a perfectly playable game nowadays, even if Assassin’s Creed fans are unlikely to forgive the game’s botched launch anytime soon. And now it seems another Assassin’s Creed game has shipped with a few visual glitches, as the recently released The Ezio Collection (a bundle of remastered Assassin’s Creed games including Assassin’s Creed II, Assassin’s Creed Brotherhood and 2011’s Assassin’s Creed Revelations) has a few graphical bugs which have been showcased in a recent Polygon video (see above). 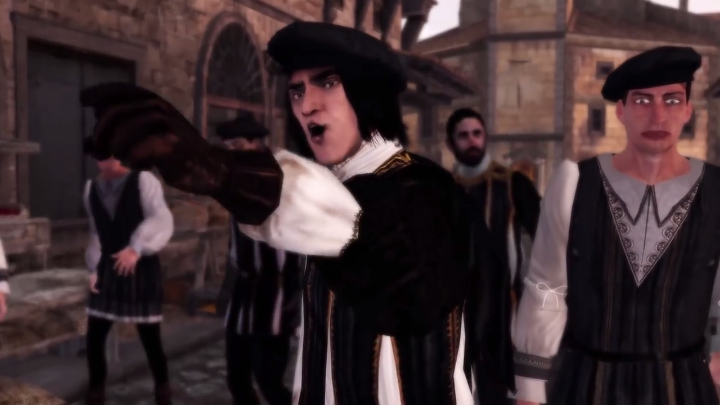 These include one guy with a funny expression on his face in one of the game’s scenes (although this obviously isn’t as dramatic as Unity’s disappearing faces though) and also some have noticed that protagonist Ezio Auditore’s climbing animation is faster and feels slightly off when compared to that seen in the original Assassin’s Creed games. But still, these glitches shouldn’t detract from the fact that The Ezio Collection features some of the best video games seen during the last console generation, and is likely a good pick for those with new-gen consoles yet to play the games or for Assassin’s Creed fans who might be upset by the lack of a new major game in the series this year, and are longing to replay the old classics this holiday season.